The Davis Marine product line offers practical solutions to real-life problems. And they're all backed by solid engineering and outstanding customer service. The marine line includes products for sailors, power boaters, fishermen, and outdoor enthusiasts of all types. Cable Covers protect sails and sheets from chafing, keep sails clean, and prevent wear. Rigging Knives combine dura-edged blades with marlin spikes, shackle keys, and screwdrivers. 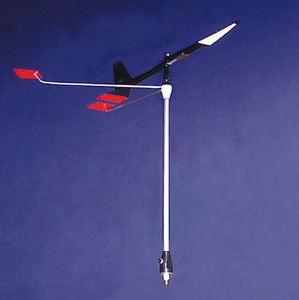 Windex wind vanes continue to offer exceptional performance at the best value of any wind indicator worldwide. The secret is in the sapphire jewel suspension bearing, large fin-low inertia vane, and easy-to-read, fully adjustable tacking tab system. Windex is the perfect choice for all cruising and racing boats 15 feet (4.6 meters) and bigger. Windex 15 has a 15" (38 cm) vane. Includes through-bolt or drill and tap mounting socket; 5/16" -18 stainless stud, washers and nut. Stands 12.75" (32 cm) tall and weighs just 3.6 ounces (101 g).